13th January 1979 Saturday A biological father Peter Ellis is searching for his son born as SHANE PATRICK O'LOUGHLIN, who was not adopted but moved to South Africa from the UK with his mother DAWN BERNICE LILLIAN. (Dawn was born in Zambia) Shane has a younger brother named LENNON O'LOUGHLIN. My birth name was Thompson, I am a female adoptee born in Pretoria. I wish to trace my biological father of whom I have no details. 22/11/2002:My biological mother name was Pricilla Anne Thompson, and the name she gave me was Anastasia Thompson. The other thing I know is that she was 17,he 32. She was blond with a fairly big bone structure ,while my biological father was "tall dark and handsome". The son of a preacher or priest, I'm not quite sure which. It has also been established that Pricilla has passed away. 7th February 1979 Wednesday A lady with Blonde hair, green eyes, medium height and weight, athletic, named Bianca Zunkell at birth wants to trace her biological mother. Bianca was born in Pietermaritzburg. 10th February 1979 Saturday We are searching for Susara Elizabeth Christina Susanna Smith, ID 450827 0020 009 a biological mother who gave birth to Yolanda Smith at the J.G. Strydom Hospital in Johannesburg. Her last known address was 70 Van Deventer Street, Randgate, Randfontein. 1st March 1979 Thursday MARIA a biological mother wishes to trace her adopted daughter ANNAMARIE D'OLIVEIRA (birth name) who was born in Pretoria. 6th March 1979 Tuesday A BIOLOGICAL MOTHER is being searched for by her adopted son Dirk Carstens. Dirk was born In Wynberg Cape province, and was adopted on 23rd March 1979. Dirk has blond hair, a light brown birthmark on his left arm, and a birthmark on the forehead between his eyes. 12th March 1979 Monday Another Rhodesian baby, born in Bulawayo Nichola Adams wishes to trace her BIOLOGICAL MOTHER. She was adopted on 6th April 1979. File No. 228/79. No further details are available at present. 13th March 1979 Tuesday A young lady, Cheyenne Barnard who was adopted at the age of three years, and who was born in Johannesburg, wishes to find her biological mother, LILIAN ANDREA BARNARD or her biological father ALLAN ROBERT BARNARD. 25th March 1979 Sunday Liza Victor (birth name) a baby girl born in Port Elizabeth wishes to find the young lady who gave her life. She was a MISS VICTOR , 5'2"tall, Green eyes, brown hair is afrikaans, hobbies Music, reading, knitting, and was unmarried at the time. Liza has green eyes, light brown hair, and has a small build. 1st April 1979 Sunday Biological mother is look for her adopted son named Jan at birth. He was born 6 weeks early in Cape Town on the 1st of April 1979. 07/11/2001 FOUND A three year old little girl Tracy Dale Coughlan / Rennie ( she was three years old when adopted) and her sister Jolene Coughlan very much want to meet their biological mother again, TAMRA COUGHLAN. Her biological father is DONALD RENNIE. Tracy writes:- If you are out there please contact Jolene and Tracy. We would really like to meet you!!! 07/11/2001; We were reunited with her a week ago and things went wonderfully. She couldn't wait to meet us. She says she has been waiting for this moment for twenty years!!! 20/08/2004: New Info On 5th April 1979 a baby girl named MARY- ANNE VAN WYK, now RONEL was born in Bloemfontein. Ronel's biological mother Susan Mary Van Wyk (maiden name), later married Ronel's biological father and had 2 sons. Sue, who is very grateful towards Ronel's adoptive parents for what they have done for her, would very much like to meet Ronel, just to see how her little girl has progressed over the years. 25/03/2000: It has been established that Ronel is a 3rd year student in Bloemfontein and was adopted by an Afrikaans family from Kroonstad. 14/06/2000: Ronel's adoptive mother contacts Jack of Adoption reunions and assures him that Ronel knows that she is adopted. She has sadly informed Jack that Ronel does not wish to meet Sue at present. 28/06/2000: Ronel calls Jack and after a long conversation agrees to meet Sue after she (Ronel) has completed her studies. 20/08/2004: Ronel again speaks to Jack, and demands to have this entry removed from the internet. She has been advised that her biological mother is the applicant and only Sue can request for it to be removed. Ronel was rather rude. It is with great disappointment that Ronel has advised me that she does not want to meet Sue, she refuses to give a reason for not wanting to meet Sue. 05/09/2009 FOUND Eugene is searching for his biological mother Annatjie Veldsman. All I know is that I was abandoned and that she has 4 children, all adopted. 5/9/2009: Eugene has advised us that he found his biological mother but has lost contact with her. His adopted sister has now been found. 17th May 1979 Thursday We trust that Thys Pretorius will have the same success as Chantal ( see same date) Thys is searching for his adopted daughter LAURIKA KRUGER (born VAN DER WESTUIZEN) who was kept by her biological mother MARINA KRUGER. Laurika was born in Pretoria. 06/05/2003 New Info Dogter soek biologiese ma. Ek wil nie inmeng nie, maar ma net sien assebief. Gebore 21 Mei 1979. Gebore as Karla Olivier. 06/05/2003: Karla has discovered that her biological mother's maiden name was CARIN ELIZABETH OLIVIER born in 1960. She's got a Matric Certificate & a Diploma as a Dental Assistant. 4th July 2000: Jolene was 27 years old when Retha was born, she has beautiful large blue eyes dark blond hair. She also has another daughter who is about 5 years older than Retha. Retha's biological father is KOBUS a farmer, loves motorbikes and raced scramblers at the time. He likes fishing and rugby. 29th May 1979 Tuesday If you are a FEMALE ADOPTEE, born in the Lady Rodwell hospital in Bulawayo, Rhodesia (now Zimbabwe) on this date, then your biological mother Brenda Holdaway would love to see how you have progressed through the years. Give us a call. 30th May 1979 Wednesday Another biological mother Sonja Van Rensburg is searching for her adopted daughter, who she named SONJA JANSE VAN RENSBURG at birth. She was born in Cape town. It is believed that she is a 3rd year student at Stellenbosch University, she has 3 brothers and 1 sister. She also has cholesterol problems. 15/10/2000:FOUND A 17 year old young lady Melaney Kruger gave birth to a baby boy at the J.G. Strijdom Hospital in Johannesburg, and named him MARTIN KRUGER. Melaney would now like to see how her son has progressed through the years. 02/02/2005 New Info I am looking for my biological daughter named Sasha Anne Coetzer at birth. I'm led to believe that her family emigrated to Australia, her name is Shirley, her father is an accountant, her mother a housewife. She has an older brother. 02/02/2005: I have just discovered the surname of my biological daughter. Her adopted name is Shirley Pugh. 22nd June 1979 Friday Patricia du Toit is the name on the adoption papers. I am searching for my Biological mother CHRISTA CHRISTINA ALIDA DU TOIT born on 16 August 1960.She was unmarried, and Afrikaans speaking. The AGS WELSYNSRAAD PRETORIA was involved with the finalization of my adoption. Please I would love to hear from, my biological mother. You have a beautiful grandson, and I wish we could meet you. 21/03/2003 FOUND Another biological mother is missing her baby boy she was forced to give up for adoption. DIRKIE BEUKES (Birth name) was born in Pretoria. 27/05/2003 FOUND A biological mother Marlene Basson (maiden name) wishes to trace her adopted daughter she named MARLENE ISABEL BASSON at birth. She was born at the Boksburg/Benoni Hospital and was adopted through the Dutch Reform Church. The adoption file number is 52/4/89851. If you have the same file, call us. 9th August 1979 Thursday I am trying to find my baby daughter named Gail Pretorius at birth born in Johannesburg. I was forced to give up for adoption. 27th August 1979 Monday Vaughn Esquino a male adoptee is searching for his biological mother. 7th September 1979 Monday Manuela Scammell (maiden name) a biological mother is looking for her adopted daughter named SANDRA SCAMMELL at birth. She was born in Cape Town at the Mowbray Maternity Home and was adopted through Child Welfare on 17th September 1979. Manuela later married Sandra's father and has two other children. 17/05/2004 New Info I was born in Port Elizabeth and adopted at birth I would like to find my biological mother. Religion: Methodist, Home language: English, Nationality: SA citizen, Marital status: single. 30/08/2002 New Info Desperately seeking my biological mother. I was born on 30th September 1979, and adopted through the "Die Kindersinode vir Barmhartiges van Suid-Transvaal" in Braamfontein, Johannesburg . My mother was 34 years old at the time of my birth and she was a nurse. My Adoptive parents named me Natascha Magdalena Henn. 30/08/2002 New info: Natascha was named Ursula Jordaan at birth. It has also been established that her biological mother was a Miss Johanna Violet Jordaan. 1st November 1979 Thursday At birth I was named Charl Smith, I wish to find my biological mother. 9th November 1979 Friday A baby girl who was adopted only 5 years after her birth, namely Chantel Van der Walt, (birth name) is searching for her biological mother, ALTA VAN DER WALT, maiden name BASSON. Her parents attended the AFM. church in Brixton Johannesburg. Her husband and two sons were killed in a plane crash on 14th July 1982. 13th November 1979 Tuesday My, name is Lee, I, very sadly, had to give up my baby son, known today as Darren, for adoption. I wish to know if he's alive, healthy and happy. He was born in Mother's Hospital, Durban on 13 November 1979. I've never forgotten him. advertiser Ten days after birth a baby boy called DUNCAN VAN DER STRUYS was given up for adoption in Durban. Duncan who may now be known as Greg or Gary was born at the Addington Hospital in Durban. 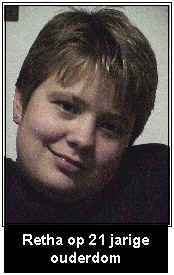 His biological mother Carole Van der Struys who now lives in Scotland would like to make contact with her son. Duncan's father is Norman Allen Van der Struys. Duncan also has a brother Brett born on the 18th May 1975. My name you gave me was Adrisina Petronella Stoppforth. I had a brother who they called "Mannetjie". He was almost 4 when I was adopted. My Biologicel parents are Brenda & Koos Erasmus.